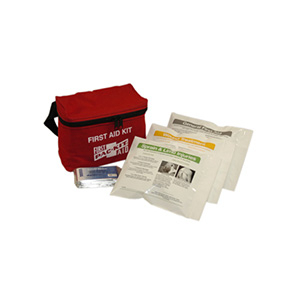 PAC-KIT FIRST AID FANNY PACK Portable for easy carrying, includes all items needed for the fisherman. Size is 6" x 8-1/4" x 2-3/4". Contents include: 10 woven strips; 2 woven extra large strips; 2 woven knuckle bandages; 2 woven fingertip bandages; 4 butterfly closures; 2 - 3" gauze pads; 5 - 4" gauze pads; 1 large wound pad; 1 4" gauze bandage; 1 adhesive tape roll; 6 antiseptic wipes; 20 antiseptic towelettes; 2 first aid/burn cream packets; 2 triple antibiotic packets; 4 X/S non-aspirin tablets; 4 motion sickness tablets; 1 sting relief wipe; 1 aluminized rescue blanket; 1 cold pack; 1 - 4" elastic bandage; 1 instant cold pack; 4 latex exam gloves.